A Dance with Fred Astaire is an extraordinary collection of anecdotes and rare ephemera featuring a dizzying cast of cultural icons both underground and mainstream, both obscure and celebrated. Memories and diary entries, conversations and insights into his work sit alongside collages of beautifully reproduced postcards, newspaper cuttings, film negatives, lists, posters and photographs, envelopes and letters, book covers, telegrams, cartoons and doodles. Mekas has kept and archived the artifacts of his life as a cultural touchstone down to the minutiae, all of which is brought together here in the form of a unique and fascinating scrapbook of a life lived with the highest artistic commitment. 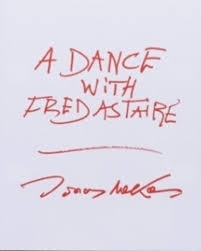 Guided by Mekas s distinctive prose and suffused with warmth, A Dance with Fred Astaire is rhapsodic, poetic and funny as all get out. A revealing visual autobiography of a genuine culture hero.